Let’s talk about cakeism. Word of the year in 2018, it is peculiar to the UK and born from Brexit. It captures the doctrine of having one’s cake and eating it too and has been used to describe the governments approach to exiting the EU. Now I don’t want to get into a political discussion, but I am rather disappointed that a word with cake in it has been used to describe something so utterly inedible! To me cakeism should be literal – having lots of cake and actually eating it. Which brings me to our tiered cakes. Cakeism describes what our tiered cakes bring to the party – lots of scrumptious cake for lots of people, so I’m hijacking this word and interpreting cakeism true to its form. Cakeism in our cake parlour has a rather more flavourful and fun meaning. With Brexit weighing heavily on our shoulders right now, we need some fun, don’t you think? So, now I’ve got that one off my chest, let’s talk about tiered cakes. Large tiered cakes used to be purely for weddings. Not anymore. How happy we are that tiered cakes have broken the mould and can be the centrepiece for any occasion. We love getting creative in the cake parlour and as far as we are concerned the more cake layers the better. 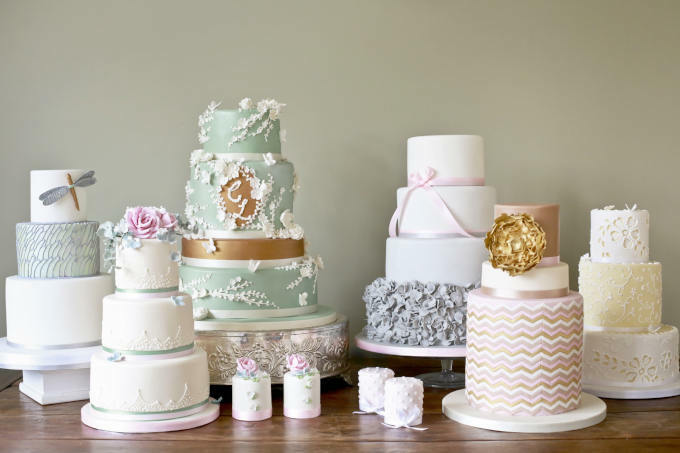 Tiered cakes are perfect for any celebration where you want to make a cake statement and feed a large number of guests with a delicious and decent-sized piece of moreish cake. There’s nothing more disappointing for guests than a thin slither of cake because there simply isn’t enough to go around. Tiered cakes also enable you to mix up the cake flavours, with each layer offering something a bit different to your discerning guests. Everyone gets to have their cake and eat it! It matters not what the occasion is you are celebrating, tiered cakes bring a little bit more to the party (and obviously more cake to go around of course). Be it a wedding, birthday, leaving do, christening, anniversary, job celebration, graduation, retirement, corporate do or any special occasion, a tiered cake will surprise and delight in more ways than one. All of our tiered cake creations look fabulous and we can vouch that our cakes taste just as delicious as they look too. At Cakes by Robin we love a big celebration and as far as we are concerned the bigger the cake, the better. If you are throwing a big party, one of our tiered cakes will wrap up dessert and keep your sweet-toothed guests in the party mood. Choose from a range of fabulous flavours from traditional vanilla sponge to chocolate fudge (one of my personal favourites), to lemon drizzle, red velvet, marble, carrot or our show-stopping rainbow cake (actually I love them all). And remember, we are cake icing artists, so whatever your cake design ideas, we can bring them to life in cake form. We can deliver your amazing cake anywhere in London (see our delivery terms and charges here). You can of course collect from our cake parlour in south west London (it’s where the magic happens). We love a chat, so do pop by. To find out more about our tiered cakes, give our friendly cake team a call. Cakeism has been redefined and one of our tiered cakes will definitely ensure your guests have their cake and eat it too.